Panda Research Review: Legit Opportunity or Scam? You are here: Home / review / Panda Research Review: Legit Opportunity or Scam? There are so many market research site available that you want to be certain that you sign up with companies that are worth your time. Is Panda Research a company you should be part of? The short answer is: absolutely not. Let’s look at why you should steer clear of this company, and focus on sites that are worth your time. Most often, this is an easy question to answer. For most market research websites, you can confidently say “You won’t earn much money, and problems do happen occasionally – but it’s not a scam”. With Panda Research, it’s not so straight-forward. There are some marks of a legitimate company, but also some serious red flags. Panda Research was founded in 2005, as an offshoot of the parent company A & A Marketing, Inc. They have 7 other companies listed, but Panda research seems to be their flagship company. A & A Marketing, Inc. is not accredited by the Better Business Bureau (BBB) and has received the lowest rating of F.
At the time of writing there were 37 complaints filed against the business on the BBB website, and their F rating was as a result of failing to respond to 18 complaints and leaving 2 complaints unresolved. That’s not a great recommendation for getting involved with this company. If you did want to join, you would need to be over the age of 18, the only member of your household to have an account, and to be legally residing in the U.S.
Panda Research takes extra steps to verify that you are where you say you are, as we will look at later. If you go to the Panda Research website, you will see the sections that are used for recruiting new members. There is a questionnaire that you can complete just to see if you would qualify for another survey for $3. 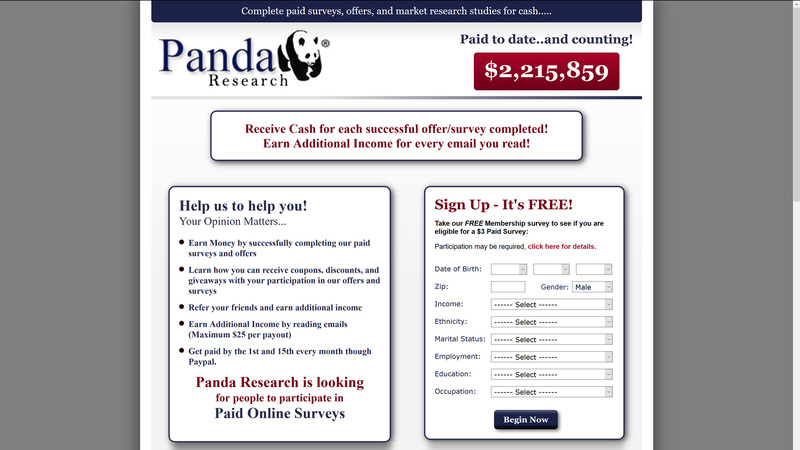 Panda Research offers a sign-up bonus of $3, so I assume this is a roundabout way to get your information. Once you sign up, you will be required to fill in your personal information so that you can be targeted for surveys and offers according to your demographics. That’s pretty normal for survey sites. After sign-up, surveys, emails and offers are available to members to start accumulating points. Email offers. You will be sent many emails with different offers that need to be signed up for to earn points. Most will require shipping and handling charges, or credit card information. Be aware that if you sign up for a trial offer and don’t cancel your account before the trial period ends, you will be liable for the costs. You also might be required to fill in a review or other task after sign-up to receive your points, so it pays to carefully read the terms. Surveys. Panda Research has nothing that sets it apart from other survey panels. They have similar surveys that will earn you about the same as anywhere else. Far better to complete surveys from a trusted company than risk all your time and effort with potentially no pay-out. Referral program. By referring others, you will earn 10% of anything they earn if they sign up through your referral link. When their payment is finalized, you will automatically be credited with 10% of what they have earned. Of course, you have to feel comfortable recommending this site to others for this feature to be of any use to you. There is a huge difference between what they say you can earn, and what you are actually likely to earn with this site. For example, the maximum payment is often said to be a hugely impressive $75 – but at the time of writing, the biggest earning survey that they are advertising on the home page will net you a much more modest $1.50. Real earning potential for surveys is more like $0.50 to $10, and expect far more surveys and offers at the lower end. The real problem with Panda Research is not so much earning money as it is actually getting paid. I have personally never seen a company with so many hoops to jump through before getting paid money that you have legitimately earned. You must use Internet Explorer to access the offers if you want to guarantee payment. You must have cookies enabled, or you won’t get your points. You must not be using a mobile device, or any offers you complete won’t credit you with points. You must earn $50 before you can request a payment. All payments are in multiples of $50 – if you have $75, you will be paid $50 with the remaining $25 left in your account until you reach $50 and can request another payment. That $50 must be made up of no more than $25 of Panda Email offers. Once you have requested your payment, you must call Panda Research by phone to confirm the withdrawal. The payment is paid 30 days after your phone call is successful, but payments are only made on the 1st and 15th of the month. Aside from occasionally waiting for payments and minimum amounts to cash out, this is far more over-the-top than any other survey site I have signed up for. I can’t help thinking that they’re hoping you will miss a step so they don’t have to pay you. Even with all these specific steps to complete, the biggest complaint against Panda Research is non-payment to members. Survey sites always seem to attract this kind of reviews, and my suspicion is that often the person has actually broken a rule and had their account canceled. However, in this case it’s a bit different – not only are there a huge number of people saying that they were simply not paid, but Panda Research openly has a clause in the terms and agreements that says that payment is not guaranteed. That’s a pretty big gamble – risking all your time and effort on a company that reserves the right to simply not pay you for it. And if the reviews are to be believed, they often exercise that right. Other than non-payment, Panda Research members say they have been paid incorrectly, with no help from customer service. There is also a lot of mention about the Panda Mail email offers – Panda Research say they don’t spam, but that really depends on your definition of spam mail. They send a lot of emails, and you have to be careful of what kind of offers you sign up for if you do follow the links. However, they do have an option to unsubscribe. Survey Police is a fairly reliable website that does basic overviews of survey sites, but they have chosen not to feature Panda Research. Having some mistakes is normal, but something like that in the legal terms and conditions does make me more cautious. They are also threatening legal action against anyone signing up for multiple accounts or using false credit card numbers to sign up for offers. I understand why, but it seems a little strange to be making threats. Conclusion: Should You Sign Up? If you are looking for a way to make some extra cash online – I strongly urge you to look elsewhere. If you have already signed up and have decided not to stay with Panda Research, you can unsubscribe and the company says it will delete all the information you entered on sign up. There are much better sites around that will actually reward you for the work you put in. You won’t get rich, but you can earn real rewards for your time and opinions. You can’t go past Swagbucks and/or Vindale Research for interesting work that will compensate you fairly. While Panda Research might sound tempting, it is obvious from the many unresolved member complaints that you should spend your time elsewhere. I’m not sure if I can confidently call this a scam, as they don’t require payment to sign up and they do seem to pay some members. However, I can confidently say – spend your time and effort somewhere else.